Here’s a recap of the information from Session 2 of our Fall Workshop. It’s not too late for you to join us for our workshops! Mealtime Conversation Starters: Fall Time Theme-Weather, Holidays, Clothing, Leaves, etc. Learning is like building a house. The foundation for the “House of Early Learning” is Oral Language. The bedrock for the “House of Early Learning is Responsive Interactions. Responsive Interactions (Definition)-Developing trusting and nurturing relationships with children that are loving, joyful, engaging and playful in a culturally sensitive environment. 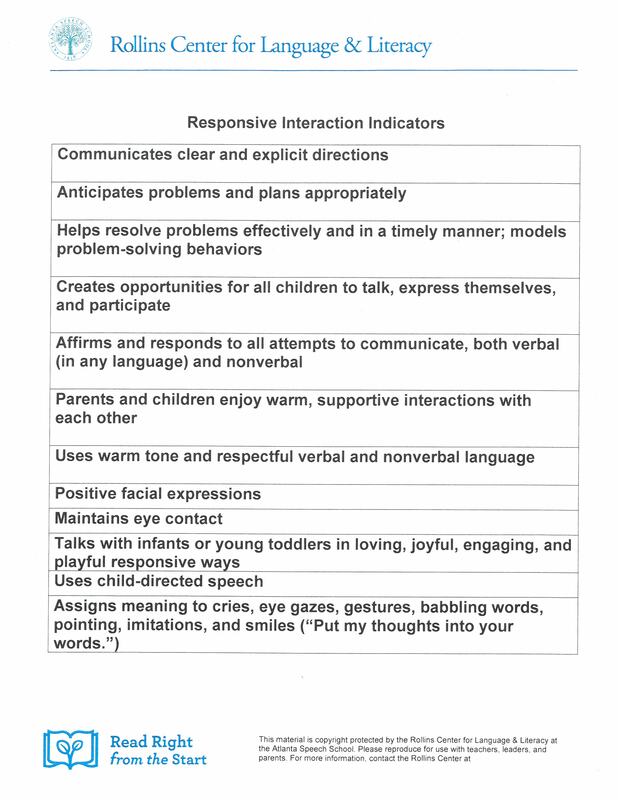 In small groups, we reviewed and discussed the attached responsive interaction indicators. We celebrated the ways in which we are currently responsive with our children. A Parent Ambassador led the group in an Responsive Interactions Relay. Each team read scenarios and decided if the parent-child interaction was responsive or unresponsive. We discussed ways to make the unresponsive interactions more responsive. Homework: Bring a family picture for the parent passport. Review the attached responsive interaction indicators and decide which one(s) you’d like to build goals around for the next 6 weeks. Prev Post: Gearing up for a new session!